What happens when a 21-year old takes a first generation RX7, throws out the rotary engine, puts in a V8, and makes a whole bunch of other questionable modifications? You get this: Corbin Goodwin's amazing RX7 hot rod. Holy crap nuggets is this thing cool. Corbin is 21 (Matt heard 19, somehow). He lives at home. He built this car in his parent's driveway. It's ratty. It's an automotive Frankenstein of parts from various other cars. It has hilarious phrases on it. It looks like it could catch fire at any minute. Suspension tuning was done by driving it on a road a few times. And that's why I love it. It is a showcase of ingenuity and passion. It looks worse than every RX7 on the road ever, which actually makes it look better somehow. Matt Farah says this car is a reflection of its owner. 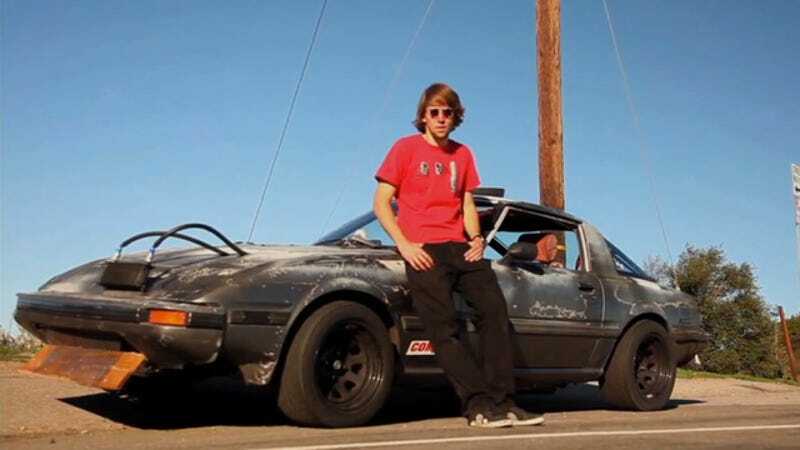 After listening to Corbin describe his car and passion, I couldn't agree more. It's a combination of his work and blood and sweat and burnt skin and pizza delivery money that formed this wild automotive creation. I wish I had something like this. And after you watch this, you'll wish that you had it too.